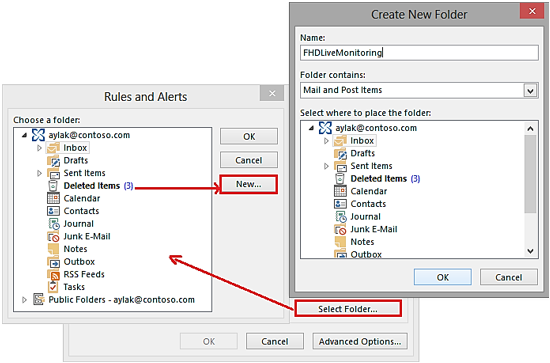 In Microsoft Outlook you can create rules for incoming E-mails. A rule performs an action automatically, based on the conditions you have specified. For example, an e-mail can be moved from the inbox to a specific folder according to the condition you have assigned to the rule. Note that rules do not apply to e-mails that have been read. They only apply to unread e-mails. 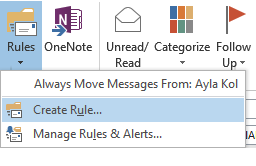 Open Outlook and click on the Rules button under the HOME tab. 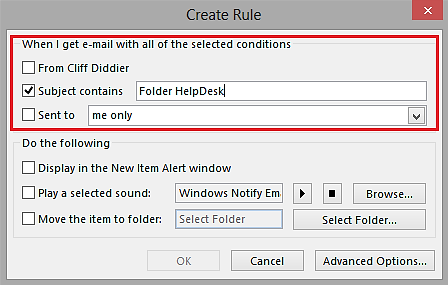 A Create Rule dialog will open. Here you can select conditions through checkboxes (Refer to the image below). You can create a rule for a specific person. When he/she sends you an e-mail, it will automatically be moved to the specific folder that you will assign. You can also specify a word (For example, Folder HelpDesk) in the subject. When an e-mail subject contains that word, the e-mail will automatically be moved to the folder that you will assign. When you click on the New… a ‘Create New Folder’ dialog will open. 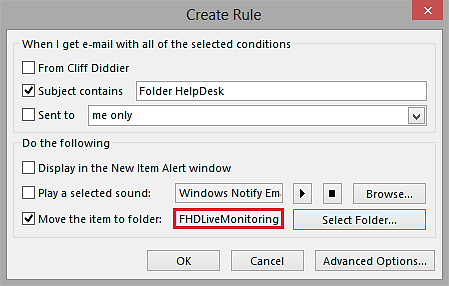 Write the name you want to give to the folder (for example, ‘FHDLiveMonitoring’ in the image below) and click OK.
Now a folder named FHDLiveMonitoring is created. Click OK. A Success dialog will open. To run this rule on messages already in the current folder check the checkbox. Now click on OK. The rule is created.